Since 1992, each session of the United Nation’s General Assembly has voted in increasing numbers to demand that the U.S. government end its blockade of Cuba. This year’s vote on Oct. 29 topped them all, with an overwhelming rejection of U.S. policy. It was virtually unanimous with only two states in the world backing the blockade, the United States and Israel. An astounding 188 member nations supported Cuba. Three Pacific island states, Micronesia, Marshall Islands and Palau, abstained. In previous years, each of these islands, virtual colonies and highly dependent on financial aid from Washington, have backed the United States. This year not one of them was willing to tow the U.S. government line. They abstained instead. In the weeks leading up to the UN resolution vote, dozens of countries took the platform to condemn Washington’s more than 50-year blockade of the island. And yet, despite the support of the world’s governments for ending the blockade, the undemocratic nature of the United Nations, with enforcement residing in the five permanent members of the Security Council, enables the United States to prevent any binding resolution from ever being voted on when it comes to Cuba. Below is the Oct. 29 UN speech of Cuban Foreign Minister Bruno Rodríguez. It is a detailed account of the severe blows against Cuba by the United States, in every sphere: medicine, children, jobs and food. However, the Cardiology Center continues to be classified by the Department of Commerce as a "Denied Hospital." The memorandum written by Deputy Assistant Secretary of State for Inter-American Affairs Lestor Mallory on April 6.1960 and declassified 30 years later, states, and I quote: "The majority of Cubans support Castro […] An effective political opposition does not exist […] 'the only foreseeable means of alienating internal support [to the government] is through disenchantment and disaffection based on economic dissatisfaction and hardship […] all possible means should be undertaken promptly to weaken the economic life of Cuba […] denying money and supplies to Cuba, to decrease monetary and real wages, to bring about hunger, desperation and overthrow of government." End of quote. The United States is not a trade partner of Cuba, as its representatives shamelessly affirm, because it cannot be, being a state to which Cuba cannot export or buy goods or services from, or use the dollar in transactions; a state whose subsidiaries in third countries cannot allow us to acquire medicines or food due to the Torricelli Act, which also prohibits the entry into U.S. ports for 180 days of all ships which dock in Cuba; a state which prevents other nations from selling us any product which has more than 10% U.S. components, or from exporting to the United States any product which contains Cuban raw materials. It is no partner as a state where the Helms-Burton Act is in effect, legislation which extended in an unprecedented manner the extraterritorial dimensions of the blockade and fully codified a "regime change" strategy and subsequent intervention in Cuba; or the state which invoked the Trading with the Enemy Act of 1917, only applicable in situations of war and only enforced in relation to Cuba. The sanctions seriously limit contacts between the two peoples and those which are permitted are conditioned with purposes of "regime change" and internal destabilization. The Cuban émigré community faces discriminatory measures. The response to Cuba’s January 2013 migratory law reform has been the continuing application of the Cuban Adjustment Act and the "wet foot/dry foot" policy which encourage illegal, unsafe emigration and trafficking in persons, leading to the loss of human life. 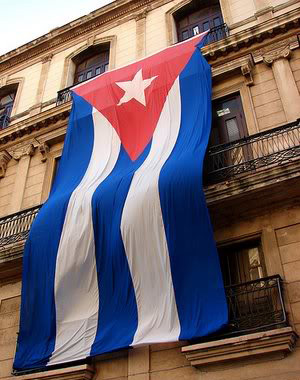 Once again, in the name of the selfless, heroic and fraternal people of Cuba, I ask the representatives of member states to vote in favor of the proposed resolution entitled, "The necessity of putting an end to the economic, commercial and financial blockade imposed by the United States on Cuba."